Elegant, versatile and durable, spinning business cases and backpacks are designed to meet the business professional's need for organization, style and mobility. Some features include: a SpeedThru™ pocket that allows for a hassle-free trip through TSA checkpoints. A RFID pocket that allows you to store your ID and passport, keeping your information secure. And the interior multi-pocket organizer lets you easily arrange and access your files and mobile devices. Also all Briggs and Riley Luggage pricing includes Free domestic shipping and more. No sales tax if shipped to anywhere outside the state of Michigan. On-line ordering is of the highest level secure format. We have been in business for over 50 years and offer 30 day Money Back Guarantee. We also stock and ship out immediately. 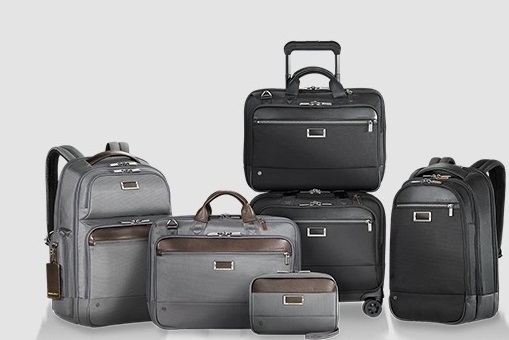 All Briggs and Riley Luggage are backed by Manufacturer's Lifetime Warranty. We also can gold hot stamp your initials at no extra charge, just specify desired initials under "Special Instructions" when placing order.